We’re making progress! Below is a picture of what it looks like now. The wooden box sits over the hole. It’s actually a whole lot more complex than it looks. It’s perfectly level and is tightly in place. 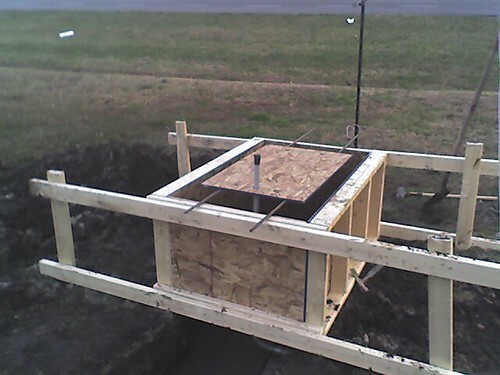 The next step, which should happen today, is to pour the concrete into the wooden box. It will be two feet deep and two feet high. After three days we can bolt the sign to the concrete block. The little PVC pipe in the picture is where we’ll run the line for the electricity to light the sign. By the way, something I found pretty interesting: I was wondering how we would get it level. I didn’t know what would be our standard to measure by. John, the stone mason in our church who is running the project, told me it’s something so obvious and simple that it’d be easy to miss: the water! If you look in the picture at the top, you’ll see we hit water. Water, obviously, lies perfectly level. So John marked the top of the water with some stakes. 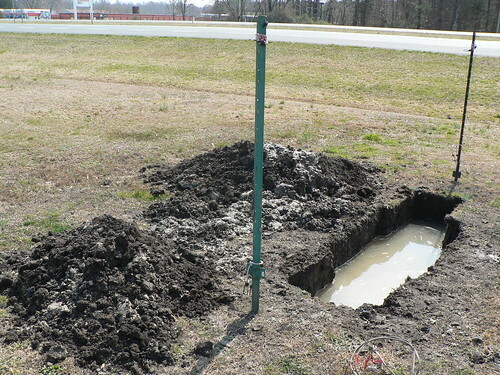 Before we pour the concrete, he’ll check the stakes to make sure they’re still level with the water, then he’ll pump out the water (or “evacuate” it, as he says in the professional vernacular). It’s actually an ancient trick. John says the Egyptians did it–but knowing how John likes to mess with me, he might’ve made that up on the fly.